Oh, le fameux trois en un :-) Je suis comme Bill, si on me demande ce que je veux en dessert: frangipane! C'est pas pour des clous que mon anniv tombe à l'Epiphanie, héhé. What a happy accident! Yay to your Bill for his improvisational brilliance. The seared grapes sound particularly-good. Oh those beautiful glowing purple orbs! I have muscadines growing in my yard and they are truly the product that I am most proud of in my garden! I love them so much that I just don't know how they could be better, but you make your recipe sound very intriguing! Thank you for the inspiration! I might have to do a muscadine photo shoot of my own! A soufflé that never falls... You may have unwittingly achieved a miracle! 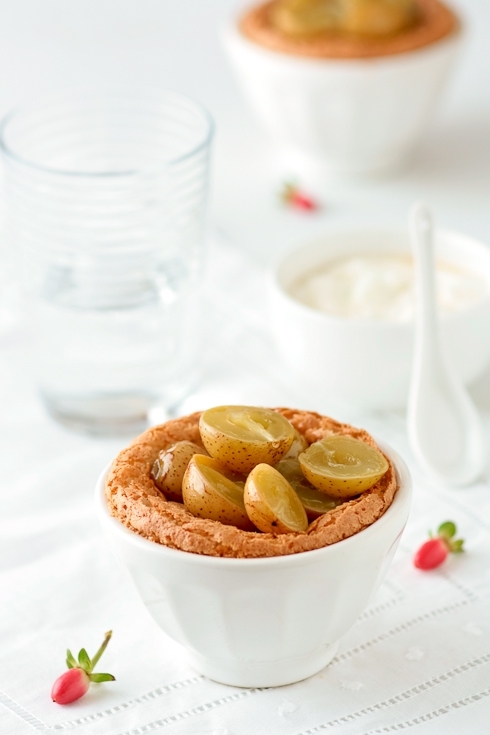 I never thought to make frangipane clafoutis, it must be divine! Just discovered your blog this morning. Absolutely gorgeous! Breathtaking as always...I love the way Bill smashed the grapes! A souffle that didn't fall...WOW! Briiliant & very very beautiful. I can't even pronounce any of what you've done, but I appreciate the explanations. I learned something and I thank you! : ) They look marvelous! Beautiful pics and great story. Isn't it funny how some of the most interesting creations originate from unexpected results? I accidentally put rose water into a banana nutella brioche pudding the other day (instead of orange blossom water) and it was awesome. Falling or not, I'd eat them all! "That works! See I can do stuff in the kitchen! "....love it! Love muscadines. This looks good. Hope your stomachache's all gone now! Always beautiful!! Love your desserts!! How beautiful it looks! It's incredible but your blog is better and better with every new photo. I really can't wait your book! Oh, Helene! The perfect anecdote to read with my morning coffee! It is the the straightforward simplicity and humor that makes your blog so inviting! You give real life a new sense of dimension. You're truly a great thinker! Love how delicate these look, and I'm in for anything frangipane (I made some tartlets with frangipane filling yesterday, they were really good). I'm sure your guests had a lovely time! That picture of those vibrant purple grapes...wow! Gorgeous photos as always - and love the stories too. I made your apricot lavender brown butter tea cakes today, only with raspberries. They are very good and so easy to make. Thanks! I am sure this will be a repeat for a tea party soon. How funny! I've never seen muscadine grapes, but since this was the first summer I've seen a number of random "foreign" (to Wisconsin) fruits, I can cross my fingers, right? Did you just defy the laws of physics? A souffle that did not collapse? Whatever it is, it looks delicious! I bought my first muscadine grapes ever on sat and cooked them savory, but I still have some left. Your idea is great for vanilla ice cream. Love your frangipane clafoutis. Aw, I can see why you and Bill go so well together. That's adorable! I think I have seen these grapes in stores recently and just wasn't sure what they were. Grapes or huckleberries? I'll have to buy some next time I come across them! I've never heard of Muscadine grapes. Happy to discover it! Te clafoutis looks so very good. looks beautiful. i must try. i love frangipane and i love clafoutis. Je ne connaissais pas du tout ces raisins mais le résultat, même s'il n'est pas celui espéré, est super ! Ils sont très très beaux vos petits desserts ! Oh Helen. Made it, & we just polished it off. Was divine. I made a Plum/Dried Black Grape Clafoutis, served with unsweetened cream & a plum/dried black grape compote. Thank you for inspiring me. I woke up with a smile this morning & headed straight for the kitchen!! I am new to your site and loving it. I haven't gotten the courage yet to try making one of your fabulous desserts but I love reading about them and your gorgeous photos! My favorite part... B. smashing the tops of the perfectly souffled clafoutis. Why waste time right? Love it! Just got some muscadines today and they are already almost gone! I have to watch my husband's moves in the kitchen. However - sometimes, much to my suprise, he does something unique and brilliant like Bill did. Love the photos! Absolutely gorgeous! Hooray for happy accidents! 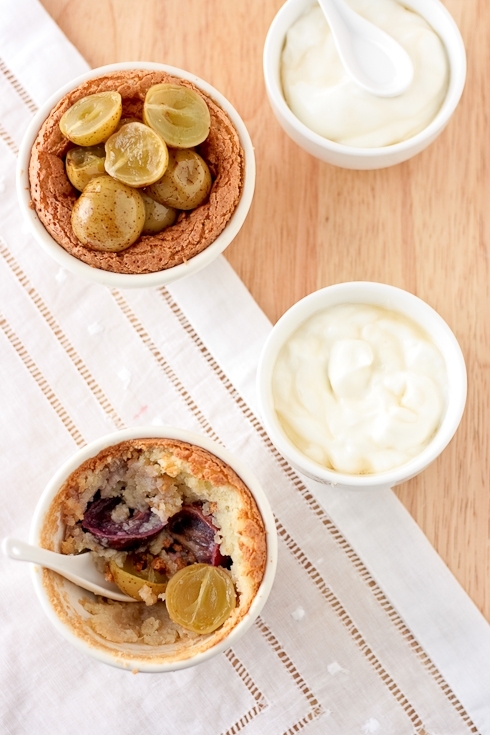 Gorgeous clafoutis- the pan seared grapes sound absolutely delicious. What a happy accident..! Lovely photos and story to go with them... So fun to find you..! Absolutely gorgeous. I love grapes! I have my eye on some concords I spotted in passing yesterday while I was rushing to another destination. You are always a total inspiration. 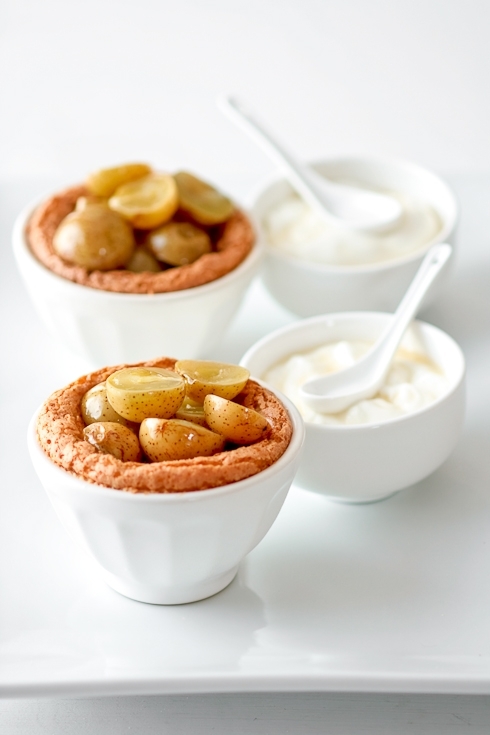 J'adore la Fangipane, les soufles.. j'adore cette recette mais je trouve que la couleur n'est pas tres "apetissante" dommage, peut etre avec des amandes emondees? Great photos...I wish I could have been there to try it all. What a great story and what a great friend you are to teach your friends about baking. Good luck with the cross stitching! Hi Helen! Thanks so much for stopping by my blog and leaving a sweet comment! 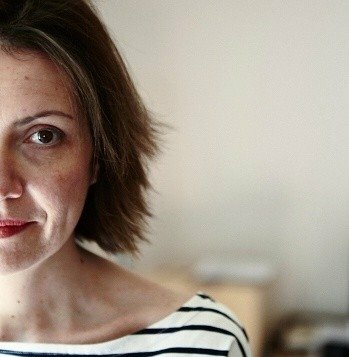 And now I've found your amazing blog! I can't wait to go thru and see what incredible French foods you've been whipping up!!! Will you come over and teach me how to makes souffles?! Irina: I have seen them under scupernongs too. I think people here enjoy saying muscadine because there is vineyard making muscadine wine (not that great but eh, we take pride in the little things!!). I love finding out about fruits that I had no idea existed... I didn't think I had heard of muscadine grapes before, but I think I've heard of muscadine wine. They're so incredibly pretty. I love how you decribed their pop as you eat them! 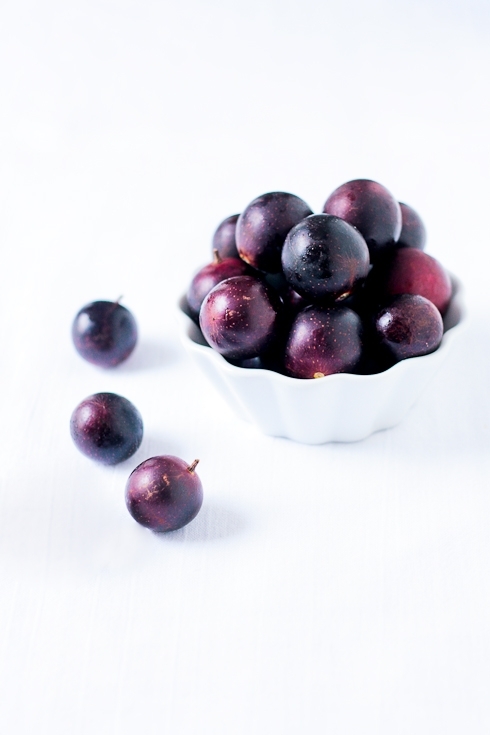 I just tried some muscadines for the first time today at the farmer's market and have been entranced with them, can't stop eating them! Unfortunately my husband not so much, just a little too weird for him apparently, so while researching the grapes online your recipe was about hit 6 on google and as my husband definitely does dessert I just attempted your recipe. I only had a 1/4 cup cream, so I halved the recipe and as only 1 egg white was needed too, I decided to beat the egg by hand... until stiff. Wow, I think the egg white beat me instead... I had forgotten how long it takes to do that!